Not to be confused with ‘Orchard Platform’ or ‘Lending Club’, Orchard Lending Club is a new peer-to-peer lending platform backed by an established AIM listed company. Lenders invest in ‘hands off’ fixed term products rather than individual loans. Capital is guaranteed by the parent company, Orchard Funding Group PLC, whose constituents have been running for up to 20 years. Expected Returns: Currently between 4% and 4.5% per annum. Provision Fund: Capital guaranteed by parent company. Sell Out: Yes, subject to another lender taking your place. Cashback: None at the moment. What makes Orchard Lending Club different to all the other platforms? 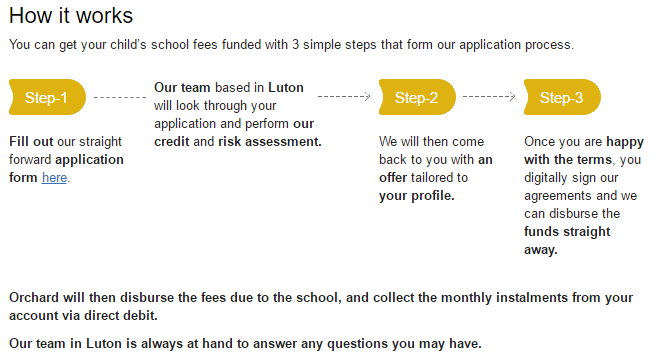 Interesting financing proposition including school and professional fees and insurance premium funding. ‘Buy Back Guarantee’ from established parent company trading on the London Stock Exchange (AIM). Long trading history of management within short term financing. Orchard Lending Club claim that bankruptcy rates from some of their borrowers such as solicitors are as low as 0.0006%. For Law and Accountancy practices, the professional bodies (e.g. Law society) take a very dim view of their members defaulting on loans or going under, often stopping them from practicing. The parent company, Orchard Funding Group PLC, is traded on the AIM market with a market capitalisation of £17.7million. The latest financials shows growing profits, turnover and reduced debt from 2014 to 2015. 53% of the parent company is owned by CEO Ravi Takhar. Overall this gives the impression of an established parent company moving into P2P lending with a CEO well invested in the success of the company. For me this suggests relatively less platform risk than other peer-to-peer lending platforms with less clarity on background or financing experience. Lending is easy. You log in and click ‘Lend Now’. At the time of writing there are 3 different combinations of fixed term products where you can earn between 4% and 4.5%, as per the blue screenshot a few paragraphs above. I’d read that rates of up to 7% were available on a 5 year investment but that’s not appearing for me. A couple of clicks more and I’m fully invested. If you need to access your funds before the maturity of your lending term or bond, you can request that we return your funds early. Our ability to offer this service relies on there being another lender able to take your place and, as such, is not guaranteed. The BuyBack Guarantee is simple: If a loan defaults, and does not repair we will buy it back from you at its current par value. We class a loan as going into default if two consecutive repayments are missed, soon as this happens our team gets in touch with the borrower to identify the cause and work out a resolution. We would notify you as soon as the loan goes into default, and you would have the option to call upon the BuyBack guarantee. From reading my glowing review you’d be forgiven for thinking Orchard Lending Club were paying me to write this review (they’re not). It all seems relatively secure for peer-to-peer lending, with protection against defaults and targeting lower risk borrowers. The downside is the rate of return. If you’re prepared to lend for 3 years, you could get 4.7% rather than 4.5% at Lending Works. However at the moment Lending Works has a huge queue for investments and waiting 1 or 2 months for your money to be allocated to investments would reduce the rate to a similar level. Another alternative to the 1 year 4% product would be Landbay, with their tracker offering around 4% and easy access to sell. A third similar alternative would be Zopa with the access account paying 3.5% for shorter term lending. If you are willing to take the highest risk without provisions you could target 10% or more on some platforms, but that is a different proposition to what Orchard Lending Club are offering. So overall, its a good investment platform and welcome addition, but rates of return are not outstanding compared to similar ‘lower risk’ competitors. You are an active investor in Orchard Lending Club or have been in the last 6 months.